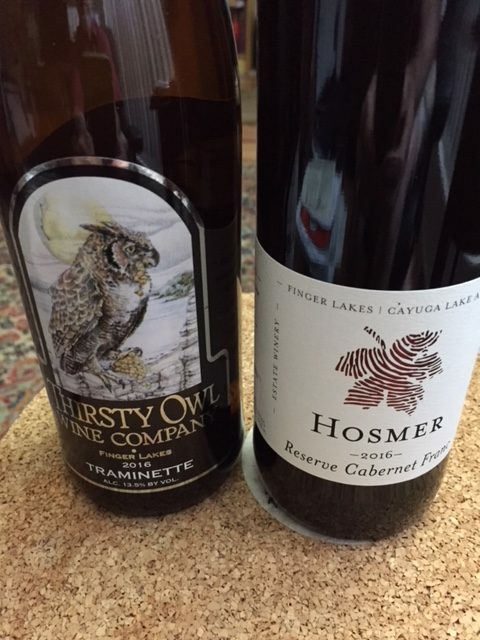 Hosmer Vineyards and the Thristy Owl Wine Company are almost shouting distance from each other on Rt. 89 on west Cayuga Lake. Hosmer is a family farm 60 years old, and current owner Cameron Hosmer planted five acres of vines in 1973 on the property; today the vineyard has grown to 70 acres of vines, and Cameron’s son Timothy carries on the family farming tradition. Cameron and his wife Maren decided to take the next step in 1986 by opening their own winery, and since then they have won a slew of top medals, and are perhaps best known for cabernet franc and riesling (their 2001 vintage riesling won the New York Governor’s Cup in 2002, made by winemaker Martha Gioumousis). Today, winemaker Julia Hoyle is continuing Hosmer’s fine winemaking tradition, and they’re producing 20,000 gallons of wine annually. *Dry Rose of Cabernet Franc 2017: Juicy strawberry and red cherry aromas and flavors with bright vibrant acidity. Tops for a dry rose with cabernet franc; you dare not ask for more. Lemberger (a k a Blaufrankisch) 2016: Fresh and lively boysenberry fruit. On the palate, lively acidity and BIG ripe red fruits; a party in a glass. Fun and original, great for spring or summer. Thirsty Owl Wine Co. is a short distance north of Hosmer on Rt. 89 on west Cayuga Lake. Although the winery was opened in 2002, the 150 acre property was purchased by Ted Cupp from Robert and Mary Plane who had started the Cayuga Lake Wine Trail; current president is Jon Cupp. Since 2002, the winery has grown by 1,000 percent according to their website, and has won not only the Governor’s Cup and the John Rose Riesling award, but the top pinot noir in North America in the Taster’s Guild International competition. Thirsty Owl has always had a crowded tasting room when I’ve visited, which is a good sign, and I like the way they feature fruit and acid-driven wines that range from the heritage diamond grape to traminette and red Bordeaux blends including malbec, grown on site. Jon Cupp was on hand to pour for me and Martha Gioumousis, editor of the Finger Lakes Wine Gazette. *Cabernet Sauvignon Ice Wine (375 ml, 17.3% R.S.) Nose: Wow! Ripe plum, cassis, chocolate and tobacco. On the palate, Juicy, spicy plum, and dark chocolate. Exotic, original and well-balanced. Great for fine fruitcake or fig-based dessert in winter.